Researchers from the University of Sheffield have published the shocking report thatchildren don't like clowns.. and many find them scarey. I know a few people who dislike/fear them, and of course have seen many of the related fictional manifestations of this, but I have always wondered about the fear itself, (known as coulrophobia) and how it comes about. Certainly a bad experience with a clown would taint you. Or seeing one at an extremely early age might have an effect. But it seems that there are some who's fear is not based on such experience, but is instead more ingrained and much harder to explain than, say, causes for agoraphobia, for example. Obviously clowns aren't so horribly hated that they can't exist. We still have them at the circus, and we still have successful children's shows like Big Comfy Couch, and there's also good ol' Ronald McDonald (though it probably should be noted that in both cases, the clowns' human features are less exaggerated). The second factor, most of them say, which also accounts for those who have not had a circus-trip or birthday-party gone terribly wrong, is to be found in the representations of evil clowns in mass media and movies, such as those already mentioned. Okay, but a couple differences come to mind. For one, there aren’t a ton of websites all over the net full of rants about how evil and awful and scary showers are (although that could be highly entertaining). And as for Jaws, C’mon now. In IT, Pennywise reaches up from the sewer and tears off the arm of little George Denbrough. Ok, that’s a pretty nasty thing. But sharks actually tear off people’s limbs, in real life! Sharks are an unequivocally real (albeit rare) danger; yet there is no vocal resistance against sharks equivalent to that which can be found toward clowns. It would seem that the concept of evil clowns and the widespread hostility it induces is a cultural phenomenon which transcends just the phobia alone. Did it arise out of the phobia or the phobia out of it? And if people got the phobia out of the movies, where did the movies get the idea from? “Throughout history, the idea of the clown has been linked with The Fool. Fool is usually taken to refer to someone lacking common sense, if not totally devoid of reason- and encompasses a broad range of characters, including both the village idiot and the harmless eccentric…The Fool’s characteristic traits are very much those of ‘Natural Man…’ Unimpressed with sacred ceremonies or the power of rulers, he is liable to be openly blasphemous and defiant; uninhibited in sexual matters, he often delight in obscene humor.” Towsen, John. Clowns. Prentice-Hall, 1976. “Clowns have many striking characteristics as well as links with Shamanism…Fools and Clowns are sub-classes of Tricksters and share most essential qualities, including their association with supernatural… Their connection with the paranormal is unmistakable.” Hansen, George. The Trickster and the Supernatural. Xlibris Corporation, 2001. And so now I have to ask you, my dear friends... are you afraid of clowns...? (A)Oh dear gawd make it go away! 2. If yes, what is it about them that you fear? 3. What caused your fear? 4. What about Ronald McDonald? (B)Oh dear gawd! Damn him and his salty fries! (D)How can anyone related to McDonald's be evil? 5. What about porcelain dolls? (A)Oh dear gawd the eyes! Like a shark's eyes...dead! DEAD! 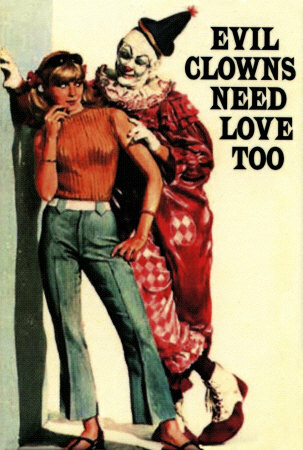 I first got my fear of clowns from Stephen Kings It! Pennywise is so creepy! I didn't know the proper term for the phobia thanks I learn something new every day! At this weekend's Lilac Festival, the girls were summoned by a clown who asked if they wanted a balloon animals. The girls, like any normal child, love balloon animals, but they looked at the clown and quickly refused. He gave this annoyed shrug and turned away, as if this was not his first snub of the day. You see, Mr. Clown had basically thrown on a clownsuit and pulled a wig half onto his head and hadn't even bothered with shaving, much less make up, and was yelling "Hey, do you kids want some balloons?" There was another clown at the festival whom the girls only hesitated a moment to go up to when he offered them some markers from his bag. He asked if we'd gotten stuff from the other clown and was surprised (or perhaps not so surprised) that the girls didn't want anything. Fortunately, the clown at the party we went to later was a little more understanding of how kids function. I never feared clowns. I thought that was a dumb thing to be scared of. But i still was creeped out by the kid sized clown in the "Poltergeist" movie. The one that the boy had sitting in the chair while he slept. I couldn't eat chicken drumsticks for a long time because of that movie.